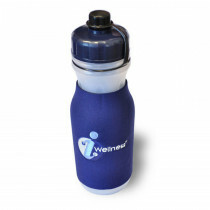 Our Water Bottles are a bit more than your typical "fill-er-up" and go bottles. Our Hiker and Ultimate Survival Bottles are packed with First Aid gear for hiking, camping and anywhere else you may go. Packed with first aid gear such as survival blankets, ponchos, matches, hand warmers, multi-tools, you know you are prepared for any minor emergency while carrying a lightweight kit. Oh, and if you want, you can even use the water bottle for...water! Just stash your gear in a pocket or backpack. Water Bottle First Aid Kits can be both light and not as bulky as regular first aid kits in cases. With the tall, round shape, if you pack it correctly, you can pack most of what basic supplies you would need for a shorter day hike or a weekend camping and carry it, just as you would a water bottle, be it in a backpack or mini bag.